Later this week, nurses and other medical workers will join the strike, which is expected to disrupt thousands of surgeries and other appointments. 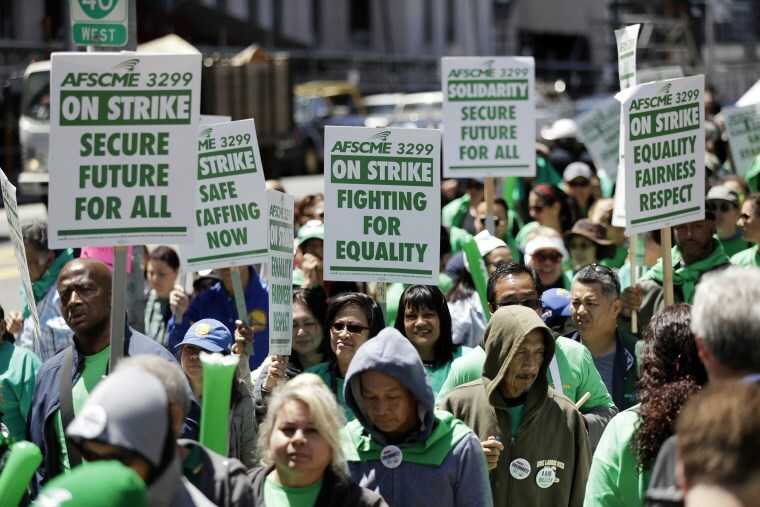 LOS ANGELES — Thousands of custodians, security guards, gardeners and other service workers at University of California campuses started a three-day strike Monday to address pay inequalities and demand higher wages. Nurses and other medical workers will join the strike later this week, which is expected to disrupt thousands of surgeries and other appointments. The service workers called for a sympathy strike by professional and technical employees, including medical assistants, nurses, radiology and other technicians. A union representing 14,000 nurses and another union that includes about 15,000 pharmacists, clinical social workers and physician assistants agreed to join the strike on Tuesday and Wednesday. “They are actively seeking out to hire contract workers in favor of directly employed workers simply because they are cheaper and that is driving inequality,” de los Angeles said. University officials said they have temporary workers to fill-in during the strike but that students should expect some inconveniences. She said the university is working hard to ensure patients and students receive the services.